The Mermaid Ranch: "i only want to sleep in these"
"i only want to sleep in these"
when it comes to my bed and my car, i do not cut corners. more importantly, you should not either. we spend more time in our beds and cars that anywhere else so therefor shouldn't these spots should be places we love to be. therefor, i throw money at making sure these places are in tip top shape! little details; is what i try to provide for my friends and family. i want them to feel special and loved. when they stay in our guest house commonly referred to as the love shack, i hope it is a small oasis away from their own. while our home is humble and rustic i try to fill it sensual details that make people melt in to their home away from home. this may be your first step to creating a dream like bed. trust me they are pure heaven. you will never want to sleep on anything else.... (you can click on the link) let me know what you think and if there is anything i have forgotten to include in my list of important things for a guest room. or if you are coming to visit. 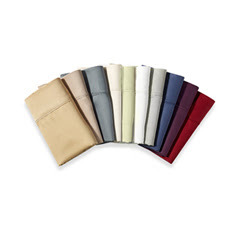 The softness of these silk-like sateen sheets will keep you in bed all day. These unique sheets are made from Modal™, a high-strength fiber regenerated from the Beechwood trees of Europe. The result is a fabric that is extremely soft, durable and radiant wash after wash with a non-iron finish. 100% Modal™, 300 thread count. Fitted sheets fit mattresses up to 18" deep. Pillowcases have a French enclosure, European style flap inside that prevents your pillow from sliding out. Queen set includes fitted sheet, flat sheet and two standard pillowcases. King and California King sets include fitted sheet, flat sheet and two king pillowcases. Additional pillowcases sold separately in pairs. Machine wash. Imported. I'm so glad you posted this. I am buying some today! One of the reasons your place is so special. okay, I personally experienced these unforgettable sheets during my "Love Shack" stay. I would describe them with words like "silky" and "creamy". Similar to the feeling of bliss you get when eating an extraordinary piece of chocolate. Great to know we can get the same feeling from these without the added guilt! OH so yummy!